There was a time that booting into Windows on a Mac seemed crazy, which is one of the reasons virtual machine software like VMware and Parallels became so popular. Once Apple made the jump to Intel-based processors the ability to boot directly into Windows became much easier. 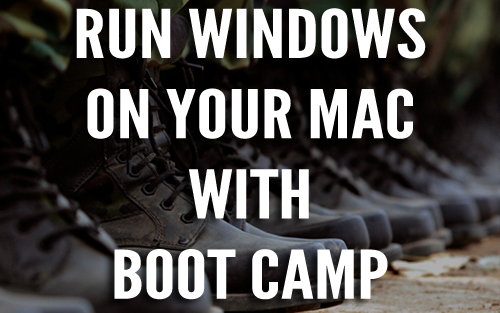 Every Intel-based Mac today comes pre-loaded with a utility called Boot Camp. With Boot Camp you can install Windows and boot directly into it, giving you native speeds for RAM, video, and peripheral ports. Best of all, Windows on a Mac in Boot Camp is the most stable way to run most Windows applications, since the installer has been tailored specifically for the Mac’s hardware. Setting it up is easy if you follow the instructions below. Latest firmware and software updates for your Mac. Windows installation media (CD, image, USB). Boot Camp does not include a copy of Windows. Once you’re sure you have the all these covered, make sure you’ve backed up OS X with Time Machine and that you’re sure everything important is saved correctly. Next, it’s a smart idea to either print out the Boot Camp installation and setup guide or pull it up on a separate machine. You’ll be restarting and using your Mac outside of an OS for some of the process, so having documentation close at hand is very important. Once you have all this set up, it’s time to get to work on Boot Camp. Boot Camp Assistant will get your Mac ready for the install process by partitioning your drive to you a place to install Windows. 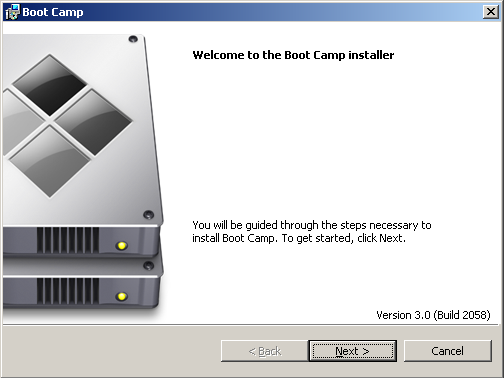 Open Boot Camp Assistant (Applications > Utilities > Boot Camp Assistant) and click Continue. Select the option to add a Windows partition and click Continue. Next, select Download the latest Windows support software from Apple. When done, click Continue. You’ll have to enter your admin username and password to complete this step. You can use a USB flash drive to hold these install files until they’re needed later in the process. Once the software has downloaded, it’s time to partition your drive. Basically you’re giving Windows it’s own little corner of your Mac to live. As far as you’ll see, it’s like having two completely separate hard drives in your Mac. Depending on the size of your internal drive and how much you plan on installing in Windows, you want to set this at a reasonable split. Windows 7 requires at least 16 GB to install correctly. Once you’ve decided on the space to give Windows click Partition. 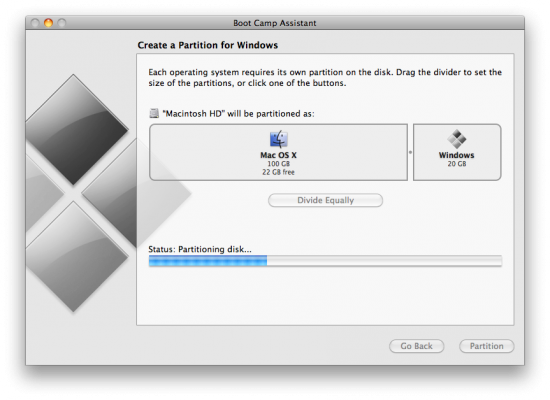 OS X will now create a partition for Windows, which will take some time. Once the process is complete, it’s time to install Windows. Remember that you need a copy of Windows 7 or later to use Boot Camp. Insert the installation disk into your Mac’s optical drive and click the Start Installation button. Your Mac will restart and you’ll go through the basic installation wizard for Windows. If you get a prompt asking if you are upgrading or doing a custom installation, choose Custom Installation. The Windows installer will ask you where you wish to install Windows. 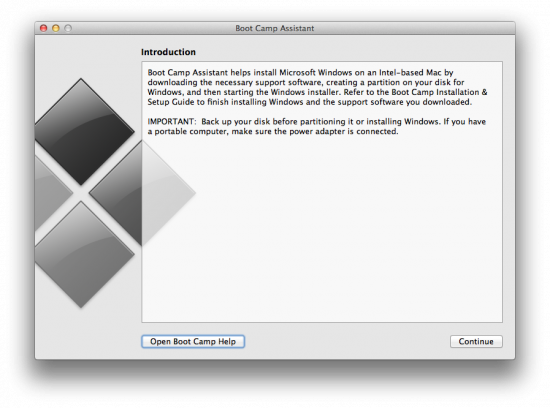 Choose the partition (drive) labeled BOOTCAMP. With this drive selected, select Drive Options (advanced) and select Format. WARNING: BE VERY CAREFUL with this step. Only format the BOOTCAMP partition. If you select any other partition, you’ll be wiping OS X from your machine. This step is necessary because OS X cannot format a drive the way Windows requires it to be, so the formatting must be done within the Windows installer. When complete, click Start Installation to begin with Windows installer. Windows will go through its standard setup and you can choose any options you wish along the way. Once the install is complete, your Mac should boot into Windows for the first time. Once it does, it’s time to get drivers up to date. 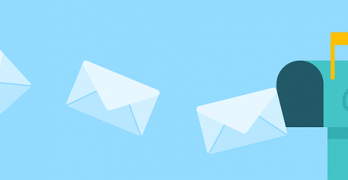 Drivers are something Mac owners rarely have to worry about, as most drivers come pre-installed with OS X, but with Windows, you must download the most up-to-date drivers possible to make sure everything works as expected. Get that USB flash drive or CD-R you used for your Windows drivers earlier in the setup process and insert it now. If you have to eject the Windows installation CD, you may have to right-click on the drive in Computer for it to eject properly, since the eject button probably needs a driver to work correctly. Navigate to the flash drive or CD with the drivers on it and double-click Setup.exe. This will start the driver installation process. If any warnings about certification testing come up, click Continue Anyway. Once the drivers have been installed, restart your Mac. It will automatically boot back into Windows. Once it restarts and Windows fully loads, the installation process is complete and you’re ready to start using Windows. Now that Windows is up and running, you probably want to know how to boot into OS X again. There are a few ways to do this. 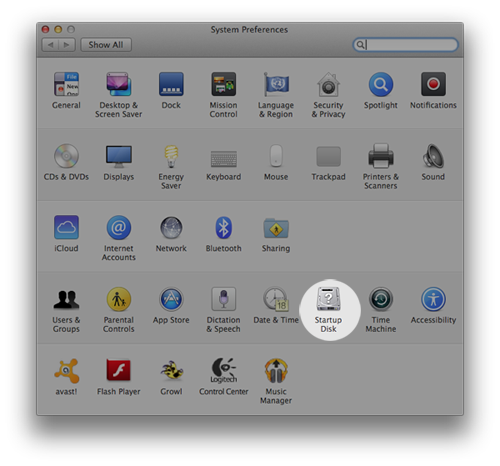 First, if you want to use Windows more than OS X, you can leave the settings as-is and click the Boot Camp Assistant icon that’s next to the clock in your Windows bar and choose Restart in OS X, but if you want to boot to OS X from a powered-off state, just hold down the Option key and press the power button. A startup disk selection screen will appear. Choose OS X and continue. Even though you can use the Option key to select the startup drive, most of us want to boot to OS X by default and choose Windows when necessary. 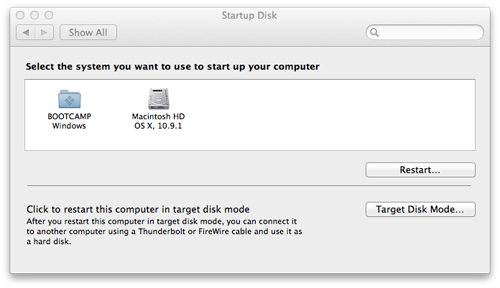 To do this, go to System Preferences > Startup Disk and choose Macintosh HD (or whatever your OS X drive is called). Once Windows is installed and working, you can actually access all your Windows files right from your Mac. 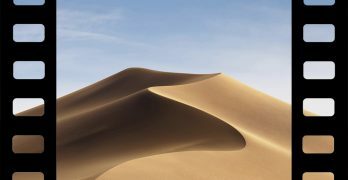 OS X can read Windows files but cannot write to a Windows drive, so all you have to do to access files on your Windows partition is open Finder and select the BOOTCAMP drive. You can save files from this drive to your Mac, but you won’t be able to save from your Mac over to this drive.